Though support has increased and opposition decreased, a potential charter amendment still faces a significant hurdle. Any campaign to pass this potential charter amendment would require a very strong and well-funded campaign. 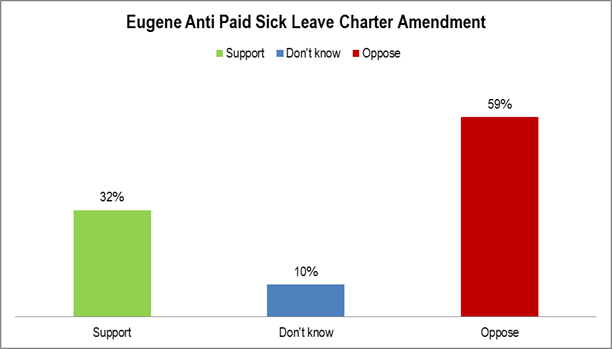 QUESTION: Do you support or oppose a City of Eugene charter amendment that would prevent the city from requiring businesses providing services within the city limits to offer sick time to employees on an annual basis? IF SUPPORT OR OPPOSE: Is that strongly or somewhat? METHODOLOGY: 200 live telephone interviews of likely City of Eugene 2014 General election voters conducted July 8-10 and July 23-24 2014. 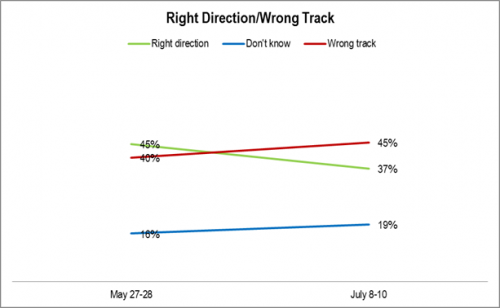 The margin of error at the sample median is plus or minus seven percent. Totals may not equal 100 percent due to rounding. Those saying Paid Sick Leave is moving too fast has increased significantly. QUESTION: Regarding the City of Eugene proposal to require businesses providing services within the city limits to offer sick time to employees on an annual basis: Do you feel the City of Eugene moving too fast, too slow, or just about right with the proposal? Familiarity is clearly increasing. All the news coverage during the two weeks clearly had an impact. It’s important to keep in mind that it’s hard to ask familiarity and get an exact answer. The responses to this question are biased upward, but are consistent across surveys. QUESTION: Regarding the City of Eugene proposal to require businesses providing services within the city limits to offer sick time to employees on an annual basis: How familiar are you with the proposal: very familiar, somewhat familiar, somewhat unfamiliar, or very unfamiliar? Respondents who were unsure were categorized as unfamiliar with the proposal. 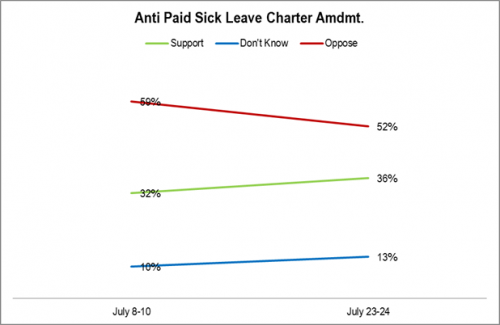 Support for Paid Sick Leave has fallen significantly during the past two weeks. Opposition continues to increase. QUESTION: Do you support or oppose the City of Eugene requiring businesses providing services within the city limits to offer sick time to employees on an annual basis? 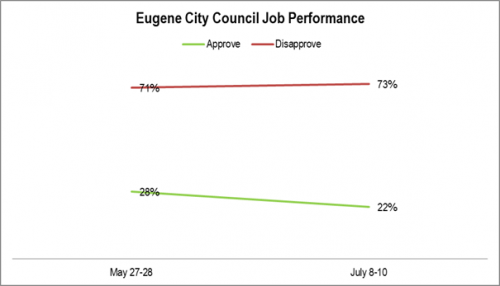 METHODOLOGY: 200 live telephone interviews of likely City of Eugene 2014 General election voters conducted May 28-29, July 8-10, and July 23-24 2014. The margin of error at the sample median is plus or minus seven percent. Totals may not equal 100 percent due to rounding. The question wording was taken from the City of Eugene website. This poll question was not paid for by any client. Though people might not like the paid sick leave ordinance, they like the idea of a charter amendment even less. METHODOLOGY: 200 live telephone interviews of likely City of Eugene 2014 General election voters conducted on July 8-10, 2014. The margin of error at the sample median is plus or minus seven percent. Totals may not equal 100 percent due to rounding. The paid sick leave ballot question is reported at: http://lindholmcompanyblog.com/?p=10800. Eugene has gone from right direction to wrong track since late May. It is likely that the paid sick leave debate is causing at least part of this drop. QUESTION: In general, do you feel Eugene is heading in the right direction or do you think things have gotten off on the wrong track? METHODOLOGY: 200 live telephone interviews of likely City of Eugene 2014 General election voters conducted May 28-29 and July 8-10, 2014. The margin of error at the sample median is plus or minus seven percent. Totals may not equal 100 percent due to rounding. The Eugene City Council’s job performance rating has dropped since May. It is likely that the paid sick leave debate is causing at least part of this drop. The simultaneous and larger drop in Mayor Piercy’s rating would seem to imply this. QUESTION: How would you rate the job the Eugene City Council is doing¬¬: excellent, good, fair, poor? 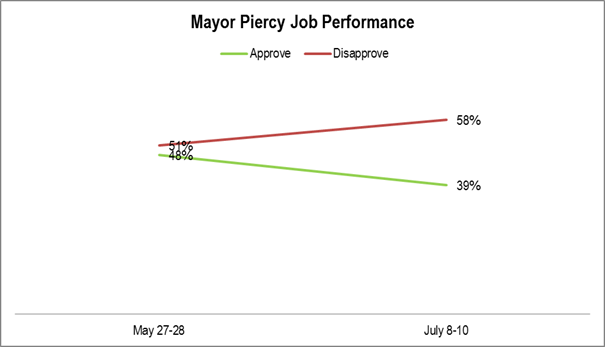 Mayor Piercy’s job performance dropped significantly since the end of May. It is likely that the paid sick leave debate is causing at least part of this drop. METHODOLOGY: 200 live telephone interviews of likely City of Eugene 2014 General election voters conducted on May 28-29 and July 8-10, 2014. The margin of error at the sample median is plus or minus seven percent. Totals may not equal 100 percent due to rounding. Applying mandatory paid sick leave to businesses located outside Eugene that do business in Eugene has even less approval. It would lose in a landslide. As in the last post, this implies the more people learn about the measure the more likely they are to oppose it. 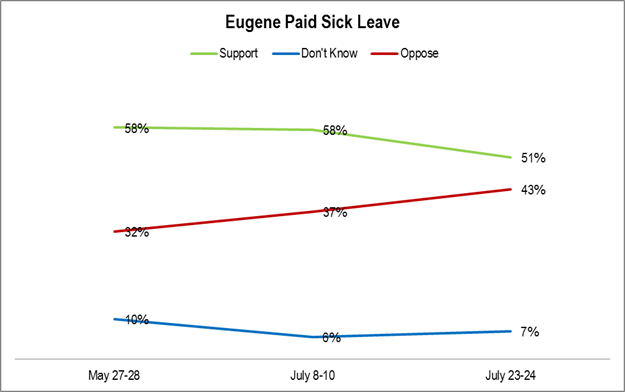 QUESTION: Who will be covered by Eugene’s paid sick leave proposal is not yet finalized. 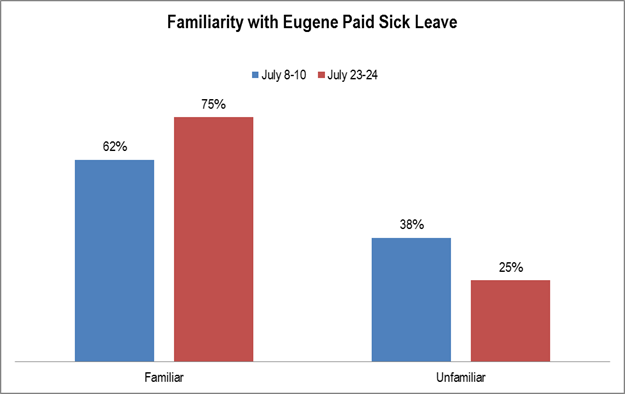 Do you approve or disapprove of Eugene’s paid sick leave proposal covering employees based outside Eugene who sometimes work in Eugene? Should Paid Sick Leave Affect All businesses? The city council currently has the paid sick leave law affecting all businesses. This is problematic. Support drops by 18% and a majority disapprove. This implies that as people learn more about the proposed ordinance, the more they will oppose it. QUESTION: Who will be covered by Eugene’s paid sick leave proposal is not yet finalized. 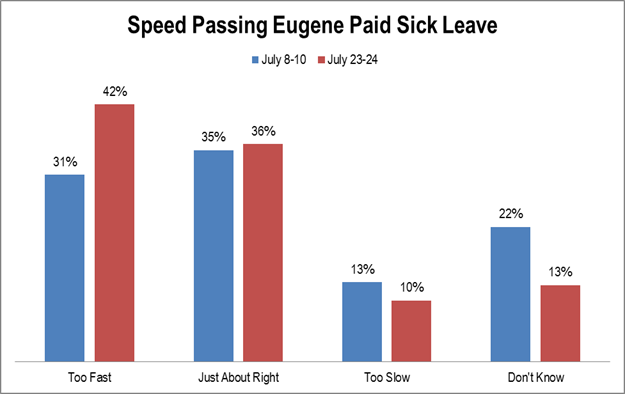 Do you approve or disapprove of Eugene’s paid sick leave proposal covering employees for all businesses regardless of the business’ size? Category: Eugene and Lane County, Political | Comments Off on Should Paid Sick Leave Affect All businesses?